Back in the mid 2000s, I was working for a talent agency which repped actors and writers/directors. I got to work on the writers/directors side much more than the actors (though I ran the mailroom for awhile which had me more on the actors side) and have enjoyed seeing some of those people make their way. Wes Ball was one of those guys. I probably only spoke with him a handful of times, but remember him as a nice guy. I was glad to see he got a shot at directing a franchise, even if MAZE RUNNER seems – on the surface – to be derivative of something like THE HUNGER GAMES. I can certainly watch the movie without bias, but it is nice to generally see good people have success. I watched THE MAZE RUNNER (2014) on 7.21.15. It was my first viewing of the film. THE MAZE RUNNER faces as uphill battle. Coming on the heels of THE HUNGER GAMES it certainly feels like a movie similar to PERCY JACKSON trying to ride the coattails of HARRY POTTER. The story concerns amnesiacs – Hollywood’s oldest cliche – this time they are a bunch of kids trying to survive and escape a giant maze in the middle of which they awake with no knowledge of themselves or why they are where they are. The movie begins by introducing us to Thomas (Dylan O’Brien) as he ascends up an elevator and into the center of the maze where he is immediately greeted by a couple dozen boys, all seemingly between the ages of 16-25. He learns that the experiment has been going on for 3 years. None can escape the maze, and it changes every day. So the crew, led by Alby (Ami Ameen), have hunkered down in the relatively safe confines of the maze’s center to strike up a life. Thomas isn’t eager to wait around. He wants to be in with the maze runners, a group that goes into the depths of the maze every day searching for answers. They are led by Minho (Ki Hong Lee). The other kids, called Gladers, try and teach him the true ways and the rules of patience and kindness and survival. But Thomas, man, he just wants to run. 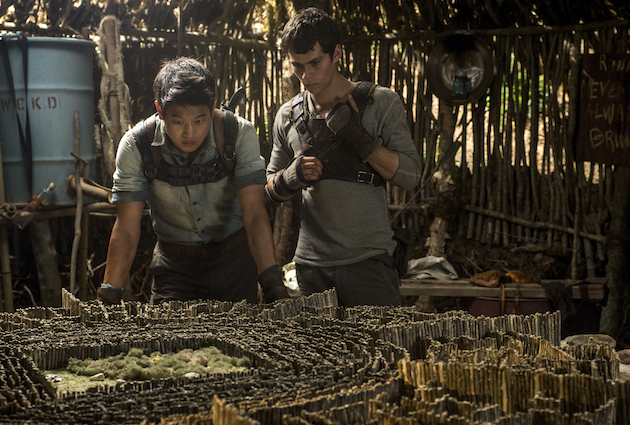 As literature, THE MAZE RUNNER doesn’t have a ton of substance. It is fairly derivative in terms of structure and story. Director Wes Ball pitched it as Lost meets Lord of the Flies. That he didn’t invoke HUNGER GAMES is a testament to just how sensitive this movie is to not be a replicant of that more famous young adult novel series. But Ball’s direction treats this as more than just a kid flick. He includes ominous visuals, some true threat of violence, and a lack of kid-focused humor. This puts MAZE RUNNER in an odd place. It is a movie made for movie-going adults as much as for young adults. It’s a smarter film than its source material, and some of the cliches it has to contend with feel beneath it (including an amazingly obvious final encounter). When the movie finally introduces an obvious female foil for Thomas, she being Teresa (Kaya Scodelario), we are already knee deep in a movie entertaining enough to overcome its cliches. Somehow, MAZE RUNNER is a fun time even as we might feel guilty for being so entertained by something so shallow. The performances help this as well, as the casting and acting work really do help to elevate this movie as well. So THE MAZE RUNNER is more fun than it has any right to be, looks better than it has any right to look, and features some above-average performances from people we might not expect have the ability to go there. To say this movie overachieves would be accurate. It had me enough to make me want to see the second one, even if the story in the final five minutes was more than a bit eye-rolling. ~ by johnlink00 on July 22, 2015. Really enjoyed this one when I saw it. Haven’t read the book yet, but I found its main character more curious and independent than those in “Hunger Games” and “Divergent.” Though the ending may be eye-rolling, there’s lots of eye-rolling things like that in the YA dystopia genre. Totally agree. I think the lead character was the reason the series will have legs.